“The Martian” is one of the best movies I’ve seen in the last few years. It’s engrossing, smart, funny, and, especially at the end, very suspenseful. I think we will hear a lot from this movie during the upcoming award season. 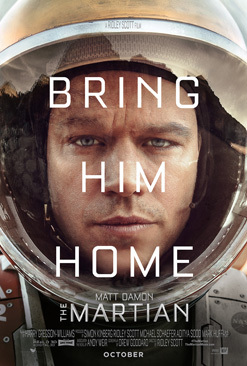 “The Martian” tells the story of a manned mission to Mars forced to leave the planet during a storm. While preparing to board the spacecraft during a ferocious, blinding storm, a projectile hits astronaut Mark Watney (Matt Damon). The accident occurs with great force, propelling Mark a great distance. In the midst of the swirling dust storm the crew frantically searches for Mark. Fearing for their safety, the crew lifts off from the planet, presuming Mark to be dead. The crew begins their long trip back to Earth. After the storm clears, we learn that Mark survived his injury and the storm. He begins the recovery from his wound. Even more devastating is Mark’s realization that he has been abandoned by his fellow astronauts. Mark returns to the shelter constructed by the crew, where they lived while on Mars. It survived the storm. It is well-equipped with food, water, oxygen and various supplies. However, Mark soon realizes that the remaining rations will only last him a limited time. He needs to think of a plan for long-term survival. Trained as a botanist, Mark begins a series of experiments to see if he can grow potatoes on the lifeless planet. After ingenious, and sometimes humorous, efforts, he succeeds. Mark also knows that he must do what he can to try to communicate with someone out there. After a few months, NASA discovers evidence from its cameras indicating that Mark may still be alive. He and NASA learn a method to communicate with each other. Next NASA has to determine a method to rescue Mark and bring him back to Earth before he runs out of food. Mark is alone, but uses his brain and his scientific training to stay alive. I also liked the way that everyone at NASA works together for the common good: to bring Mark home. Even the Chinese Space Agency offers its assistance. Furthermore, Mark’s fellow astronauts must decide whether they are willing to risk their lives to return to Mars to rescue Mark. In all this, “The Martian” is optimistic. With so many divisions in our country and world today, “The Martin” reminds us that people can come together and work for a common goal, putting aside their differences. At a time when superheroes with fantastic powers rule the box office, “The Martian” reminds us that brave, smart, and dedicated people, working together, can produce great results. As in “Apollo 13,” a potential tragedy becomes a moment to celebrate. Adding to the enjoyment of “The Martian” is its sense of humor. Even facing possible starvation, Mark is able to laugh at himself and his predicament, and, in doing so, puts everyone a little more at ease. To Mark’s chagrin, the only music he’s able to find, while alone on Mars, is recorded 1970s disco music, left by one of his colleagues. The improbable music makes him, and us, smile. Much of the success of “The Martian” can be attributed to Matt Damon. He spends much of the movie on the screen by himself. He is able to use his likeable, everyman quality to get the audience on his side. He speaks his thoughts and emotions aloud, often dictating, hoping that someone would hear him one day. In doing so, Mark bears his soul, with his keen mind, sense of humor, and positive attitude. He faces his own mortality without any self pity. The audience becomes Mark’s soul mates. At the end of the movie, [spoiler alert], Mark tells a group of astronauts in training that they will face death in space. When they do, don’t panic. Make a plan. Do one thing first, then, when finished, do the next thing and keep on until your problem is solved. Sounds like pretty good advice! “The Martian” is a great movie. It’s the kind of movie that I loved seeing on a big screen. It also does something exceedingly rare: It touches the brain and the soul, while being vastly entertaining. What more could you want?